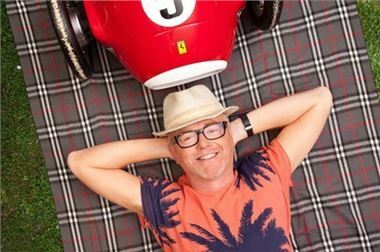 From thinking about it live on his Radio 2 Breakfast Show in March to making it real took just six months, and now 40,000 people can enjoy what Chris loves most: great cars, great food and great music, with the profits going to BBC Children in Need. All 20,000 tickets to the Laverstoke Park Farm event sold out within minutes of being put on sale. Fuelled by this instant sell-out Evans announced a second CarFest to be held a fortnight later at Cholmondeley Castle. Once again all 20,000 tickets were grabbed within hours of the box office opening, though a recent licence extension has now made a few more tickets available. 1979 F1 World Champion Jody Scheckter switched careers to become an organic farmer at Laverstoke while Cholmondeley is the setting of the annual Pageant of Power. Taking its lead from Evans’ established ‘Magnificent Seven’ drive and dine road trip that allows high bidders to experience some of his fabulous Ferraris in exchange for major donations to BBC Children in Need, groups of invited cars will roar up the respective driveways of Laverstoke Park and Cholmondeley Castle in clusters of seven. Chris’ Magnificent Seven: Ferrari 275 GTB; Ferrari 288 GTO; Ferrari F40; Ferrari 512 Testarossa; Ferrari 599 SA Aperta; Ferrari FF and Ferrari 458 Spider. European Supercars: Lamborghini Aventador; McLaren MP4-12C; Porsche Carrera GT; Aston Martin DBS; Mercedes SLS; Maserati MC Stradale; Ferrari 458 Spyder. US Supercars: Shelby Mustang; Ford GT; Dodge Viper ACR; Chevrolet Corvette ZR1; Saleen S7 Twin Turbo and SSC Ultimate Aero. Far East Supercars: Nissan GTR; Honda NSX; Mazda RX7; Nissan Skyline R35 GTR; Toyota Supra Twin Turbo; Lexus LF-A and Subaru Impreza R1. Motorsport: Marussia F1 car; WRC car; BTCC car; Bowler Nemesis; Silk Cut Le Mans Jaguar; Pikes Peak Peugeot 405 T16 and Radical. £1 Million or More: Aston Martin One-77; McLaren F1; Ferrari Enzo; Bugatti Veyron; Lamborghini Reventon; Pagani Zonda Cinque and Koenigsegg Agera R.
Group B Rally Cars: Audi Quattro S1 E2; Lancia Delta S4; MG Metro 6R4; Ford RS200; Peugeot 205 T16 E1; Renault 5 Maxi Turbo and Toyota Celica Turbo. Historic F1: Williams-Renault FW18 (Damon Hill’s 1996 Championship winner); Benetton B192 (Michael Schumacher’s 1992 maiden grand prix winner); Lotus 101 (Nelson Piquet’s 1989 car); Lotus 72 (Emerson Fittipaldi’s 1972 Championship winner); Lotus 80 (Mario Andretti’s 1979 car); Brabham BT42 (Carlos Reutemann’s 1973 car); Brabham BT7 (Jack Brabham’s 1964 car) plus an ex-Jody Scheckter Ferrari. Design Classics: Lamborghini Miura; Aston Martin DB4; Jaguar E-type; Mini Cooper S; Citroen DS; Mercedes SL Gullwing and Ford Mustang GT390 Fastback. Gorgeous: Maserati MC-12; Ford GT40; Alfa Romeo 8C Cloverleaf; AC Cobra; Jaguar XJ220; Aston Martin V12 Zagato and Pagani Huaya. Unusual: Superbike; Carver One; JCB Dragster; Sinclair C5; KTM X-Bow; Peel P50 and VW Beetle V8. As a result show-goers are encouraged to bring their dancing shoes, their air guitars and their fine voices and get ready to party on both Saturday and Sunday evenings. Chris Evans himself will host the stage, introduce the bands and will occasionally take the turntables for some good old-fashioned DJ action. To get everyone in the right party mood, top tribute bands including the Counterfeit Stones, Ultimate Eagles and Bootleg Beatles kick off the live music action with Texas, Razorlight, The Magic Numbers and Merrymouth (featuring members of Ocean Colour Scene) heading the bill at both CarFest festivals. The Feeling join the Laverstoke line-up while Paloma Faith and The Proclaimers are on the Cholmondeley bill. More than just a CarFest venue, Laverstoke Park has an enviable reputation for its organic/biodynamic farm producing the best-tasting, healthiest food, without compromist CarFest goers South and North will be offered a wide range of Laverstoke’s finest from early morning breakfast with organic, nitrate-free, bacon rolls to a full supper at the end of each day. Along a similar theme, a special Britain’s Best Pavilion will house the very finest food and drink that Britain has to offer as chosen by a panel of food experts. Products on offer include breads, cheeses, meats, cakes, jams and much more. Adding a little more spice plus a slice of competition to the culinary content, 50 pie makers and 50 cake makers will go head-to-head in a unique Cakes vs Pies contest. Initial judging will take place on Saturday with Mary Berry and Paul Hollywood selecting the ultimate champion on Sunday. With losing pies and cakes being made available for visitors to buy no one is going hungry! Keeping the whole family entertained will be a wide variety of air displays, arena shows, kids zones and more. Those performing include the RAF Hot Air Balloons, Dancing JCB Diggers, Trailstar Motorcycle Trial Riders, Segway Racing, The Blades aerial display team, a firework display from Fuse Fireworks plus jousting from the The Knights of the Damned. For foodies Laverstoke Park Farm will be running a range of workshops including ice cream making, bread making, butter churning and biscuit decorating. It will also host a DIY BBQ Zone where visitors can cook food they’ve bought from around the show and get expert advice from staff. With so much to experience, a large number of CarFest visitors have purchased full weekend tickets and are taking full advantage of the large number of camping options being offered at both events. These range from simple overnight tent pitches to luxurious pop-up hotels for those seeking the ultimate VIP experience. Right from the outset, Chris Evans knew that he wanted CarFest to raise vital funds for BBC Children in Need. A minimum of one third of the price of each ticket plus any further profits from the running of CarFest will benefit the charity. A limited number of VIP tickets are still available for CarFest South while an extended licence has enabled the organisers to offer some additional day and weekend tickets for CarFest North. For more information visit: www.CarFest.org.